Traveling soon? 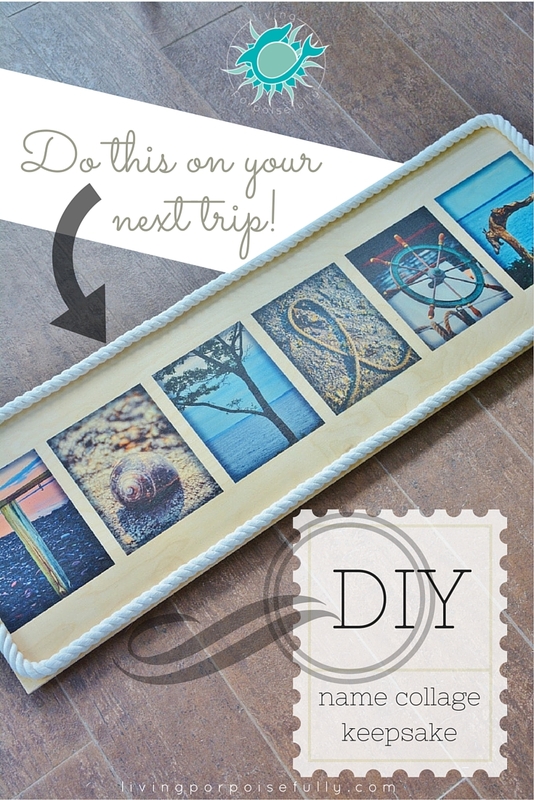 This fun idea will turn your memories from the trip into a lasting keepsake you can hang at home! One of the most fun parts about traveling is that you get to make new memories and take them home with you! That’s why taking pictures is so much fun too…it lets you try and capture the magic of what you’re experiencing. On our trip to Maine last summer, we took our picture-taking to a different level…and kept our eyes peeled for letters in our last name that might be hidden in the scenery. That way, we could make a collage later that spelled out our last name and captured memories from our trip! You might have seen this kind of creation out there in shops, and the added charm of finding them yourself is so fun! It became its own memory in itself, a fun game of finding our letters hidden in the scene. Once you make the collage and save it as one image, you can load it onto a photo printing site to have it printed (we had ours printed on wood at Shutterfly.com). We added a piece of 1″ white rope around the border with wood glue just to give it an extra nautical touch. Or, instead of making a digital collage, you could print each letter individually at home and frame each one or attach them to a piece of wood or canvas. It was a fun addition to the trip, and made us more fully experience our surroundings and the scene in front of us. Each letter makes us think of the time we found it, and it was a great way to bring home our memories. So, the next time you embark on a trip, make it a mission to search for the letters of your name in the scenery and snap a picture. It’s a joyful way to make memories and remember them! And isn’t that what traveling is all about? Enjoy! Next Post Spark Change for a Healthy Ocean! This is a great idea! With summer almost here I think it would be a fun family activity on summer vacations or day trips as all are on the look-out for the special letters, even first names for each! Another winner! This is such a lovely idea and looks great! !